, a physician and politician, was born at Besanon, a town of Franche Comte, in 1588. He was descended from a family distinguished by literary merit, as well as by the services it had done its country. He was educated at Besanc/ni, and then travelled through several parts of Europe, where he became acquainted with all the men of letters, and in every place made his way into the cabinets of the curious. 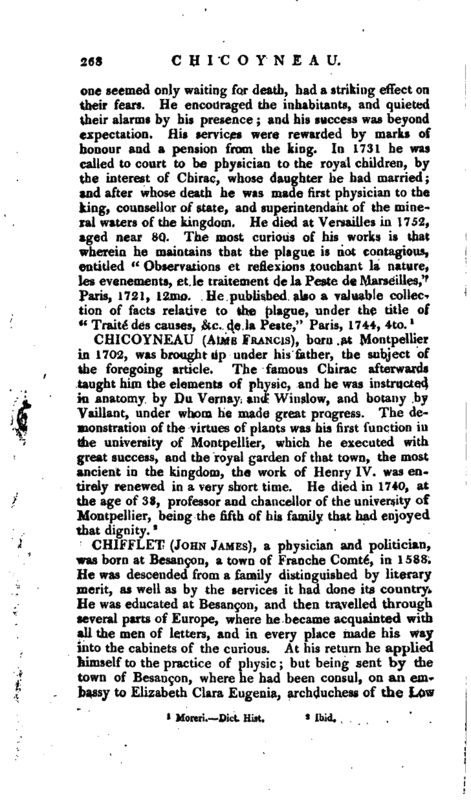 At his return he applied himself to the practice of physic; but being sent by the town of Besan^on, where he had been consul, on an embassy to Elizabeth Clara Eugenia, archduchess of the Low | Countries, that princess was so pleased with him, that she prevailed with him to continue with her in quality of physician in ordinary. Afterwards he became physician to Philip IV. of Spain, who honoured him very highly, and treated him with great kindness. Chifflet imagined, that these bounties and honours obliged him to take up arms against all who were at variance with his master; and accordingly wrote his book entitled “Vindiciae Hispanicse,” against the French. He wrote several pieces in Latin, which were both ingenious and learned, and were collected and published at Antwerp, 1659, fol. 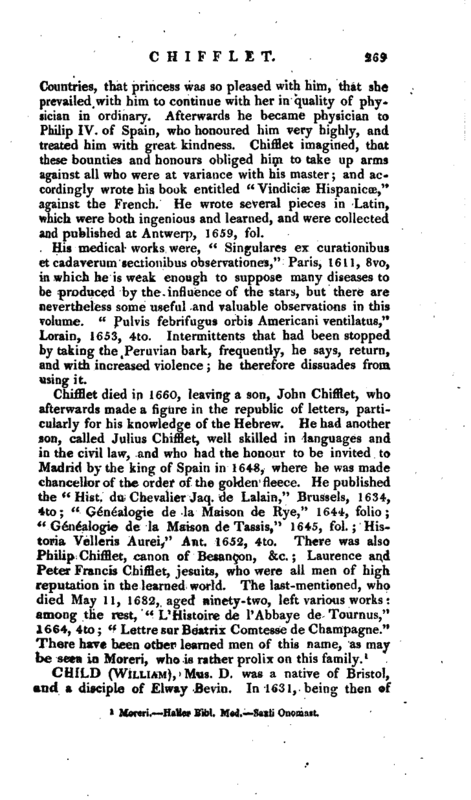 His medical works were, “Singulares ex curationibus et cadaverum sectionibus observationes,” Paris, 1611, 8vo, in which he is weak enough to suppose many diseases to be produced by the influence of the stars, but there are nevertheless some useful and valuable observations in this volume. “Pulvis febrifugtis orbis Americani ventilatus,” Lorain, 1653, 4to. Intermittents that had been stopped by taking the k Peruvian bark, frequently, he says, return, and with increased violence; he therefore dissuades from using it.